DAY 7 – Galena, Ill., to Blanchardville, Wis.
Around 10:30 a.m. we hit Rt. 20 South to Galena, Ill., crossing back over the Mississippi River along the way. I had read that Galena was the Midwest’s nicest small towns, but we had no idea just how nice it would turn out to be. When you pull onto the main street, passing through the town’s enormous, 20-foot-tall flood gates, you’re immediately struck by what lies ahead. Beautifully maintained and restored 19th-century brick buildings line either side of the curving Main Street. You feel like you’re on a movie set rather than in a real-life town. At one point the two-way traffic ends and the street becomes a narrow, one-way lane. It’s nice because you only have to look one way when you’re crossing the street, which you end up doing time and time again to visit the town’s many eclectic stores and eateries. When we first arrived, my daughter had to use the restroom, so we popped Big Bill’s Sandwich Shop and Coffee Bar. I ordered a coffee and the barista informed me that a scene from “Field of Dreams” was filmed in their cafe. As it turns out, much of the scene where Ray goes back to 1971 to meet Doc “Moonlight” Graham was filmed right here in Galena. We spent a good three hours perusing the town and it’s many shops, and it still was far from enough time. I must have taken a hundred photos of the architecture alone. While I’ve been to many small towns with these lovely old brick buildings (including my own town of Beaver, Pa.), I’ve never been to one like Galena, where virtually every building on either side of the street is original. It’s a miracle considering that the town’s been through several devastating floods over the years, including one in 1828 when the water was high enough to allow steamboats through town. The kids loved Galena, too, mainly because the one store we patronized had some really cool fidget spinners at a third of the cost you’ll find them elsewhere. If that’s not worth driving 600 miles, I don’t know what is. Around 1:30 p.m. we decided to hit the road again. We were excited to get to our next stop — a surprise for the kids — and enjoy the beautiful day. Along the way we passed the Ambrosia Country Inn, which featured an old corn silo turned into a cottage, complete with a front stoop. Next, we stumbled upon Shullsburg, thanks to the huge “historic district” sign along the side of the road. (Those darn things get me every time.) Again we were amazed to find yet another charming midwest small town, much like Galena, but on a much smaller scale. As soon as we pulled into town, we saw these strange-looking motorcycle-trike thingies and stopped to ask about them. Their friendly owners were natives of the area and directed us across the street to try some cheese curds, which they claimed were delicious and — most important, according to them — extra squeaky. I had never had a cheese curd before and had no idea if squeakiness is a desirable quality in a curd. We followed their advice and, yes, the curds were both delicious and squeaky. Before leaving town we stopped at The Crooked Canvas for a cup of coffee and met one of the owners, John, who was more than friendly (as the vast majority of Midwesterns are), and who brewed me once heck of a cup of joe. Reluctantly, we packed back into the Hyundai and headed out of town. But first we made a detour just a mile away to “Gravity Hill.” Let me paint the picture for you: You’re driving along an old country road, nothing but vast cornfields on either side, when you come to the base of a hill where the letters “G” and “H” are painted on the road. When you stop in front of them, the front of your car is definitely facing on a slight downward slope. However, when you throw the car in neutral, slowly you begin to roll backwards, as if being pulled by some giant magnet back towards town. But here’s the thing: you’re being pulled uphill. It doesn’t make sense. (We actually have a similar phenomenon back in PA.) The kids loved it. So did we. Eventually, after traversing 20 or so miles of County Highway Fs, Cs, and other letters, we finally reached our stop for the night, the Circle M Market Farm in Blanchardville. At first the kids were less than enthused about it. After all, there would be no queen beds to jump back and forth across on, no over-chlorinated swimming pool to splash around in. But then as soon as they saw the inside of our “room” for the night, their attitudes changed. Instead of a hotel or motel, this night we would be “glamping” in a vintage 1968 Holiday Trav’ler camper just in back of the farmhouse! The camper comes complete with your very own deck, from which you have a view of the farmhouse, their homemade hot tub, and a ginormous maple that must be at least 150 years old. Our neighbors during our stay included a gaggle of white geese, three goats, and a handful of pigs. There’s also a friendly dog and several cats and chickens roaming the acres. It’s one of the most peaceful places I’ve ever been, and it was our home for the night and at least the next morning. Within a few minutes of arriving I treated myself to one of the complimentary local craft beers, which were stocked in the refrigerator in our camper. Meanwhile the kids were keeping busy milking and feeding the goats and basically having a grand old time, old-fashioned-farm style. Around 6 p.m. a freak storm blew in, so we hopped in the Hyundai and headed into town where, upon a recommendation of our host, Kriss, we dined at Lady Dawn’s. This is your quintessential Midwest main street tavern, complete with a large, plastic Pabst Blue Ribbon sign out front (also an Old Style neon sign too, which we’d seen all over the Midwest). Inside, the walls were adorned with Packers and Badgers stuff, while the bar itself was packed with locals and a large group of bikers whose “hogs” we’d spotted outside. I ordered the Lady Dawn burger, which turned out to be about as big as my head. Pretty tasty, too. After a quick meal and a couple beers, we hightailed it out of there because it was obvious the Saturday evening crowd was beginning to loosen up from their PBRs and Old Styles. That night our hosts, Shannon and Kriss, made a campfire and we roasted s’mores as the sun went down over the Wisconsin horizon. Around 11 p.m., when it finally became completely dark, the sky lit up like I had never seen before. I literally felt like I was on another planet. I had never seen so many stars in my life! This was a brand new sky to me, with never-before-seen constellations and the Milky Way clearly visible. I could’ve looked up at it forever. 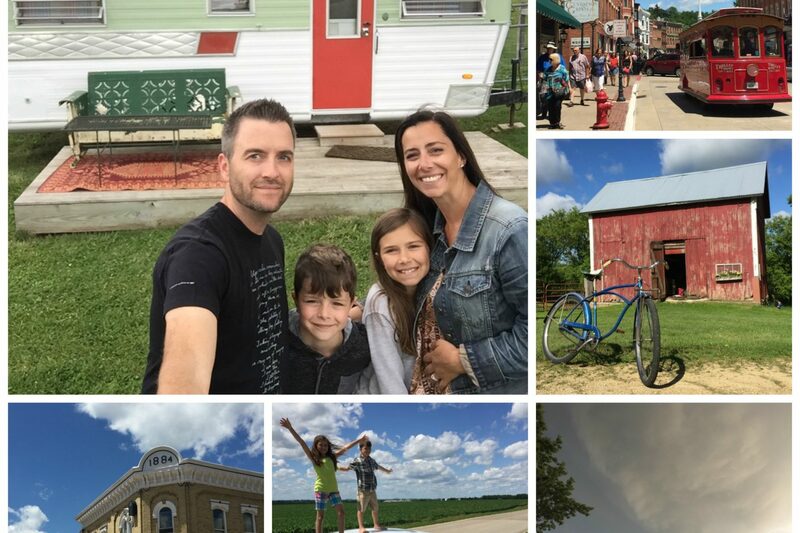 DAY 8 – Blanchardville to Milwaukee, Wis.
My pesky bladder woke me at 6 a.m., and I couldn’t go back to sleep with all the sounds from the farm. So I left my wife and kids in the camper and went inside the farm house, where I found our hosts already cooking a fresh farm breakfast for us. I poured myself a nice, strong cup of coffee and went out on the back porch to feel the warmth of the sun (it was only in the mid-50s outside), all the while one of the many farm cats kept me company. After breakfast the kids took off running around the farm (because that’s what kids do on a farm), and I tried to read a little of Kipling’s Captains Courageous in an adirondack in the yard. However, my cat BFF wouldn’t let me be and kept climbing up on me to try to get to my coffee. So instead I decided to take a ride on one of the farm’s vintage Schwinns. Pedaling down the dirt driveway, I turned out onto the main country road towards downtown Blanchardville. Both the road and the town were blissfully quiet, I assume because it was Sunday morning. After taking a few photos, I pedaled back to the farm, made my way over to a little wooden bench beneath a copse of trees, and sipped on a Spotted Cow from the New Glarus Brewing Co. Just a few feet away, the kiddos and Mama were curled up in a couple hammocks. The birds were chirping, a cool breeze was blowing, and the sun was in and out behind the partly cloudy, brilliant blue sky. Is this heaven, I thought. No—it’s Iowa. We really, really didn’t want to leave the Circle M Market Farm. And I mean really. But unfortunately we had a nonrefundable hotel room in Milwaukee, so we had to go. But not before a wonderful morning at the farm. Around 1:30 p.m. we reluctantly bid adieu to our hosts and hit the road to Milwaukee. An hour or so later we arrived in Madison, the state’s capital. I have to admit I was a little disappointed. Madison is definitely a college town and the area we visited seemed contrived and lacking any character. We stopped briefly to have a cup of coffee, and I got a chance to check out the two record shops, but before long we were back on the road. As I was dropping the kids and Cass off at the front, a cab pulled up and I could have sworn that Val Kilmer stepped out and went inside. After I parked the car, I came back and saw him sitting outside in the atrium having a cigarette. I tried Instagramming him to see if it was really him but got no response. We actually ran into “Val” a little later when we were looking for a place to eat, but I still couldn’t confirm if it really was the legendary Iceman from “Top Gun.” I was too chicken to ask. 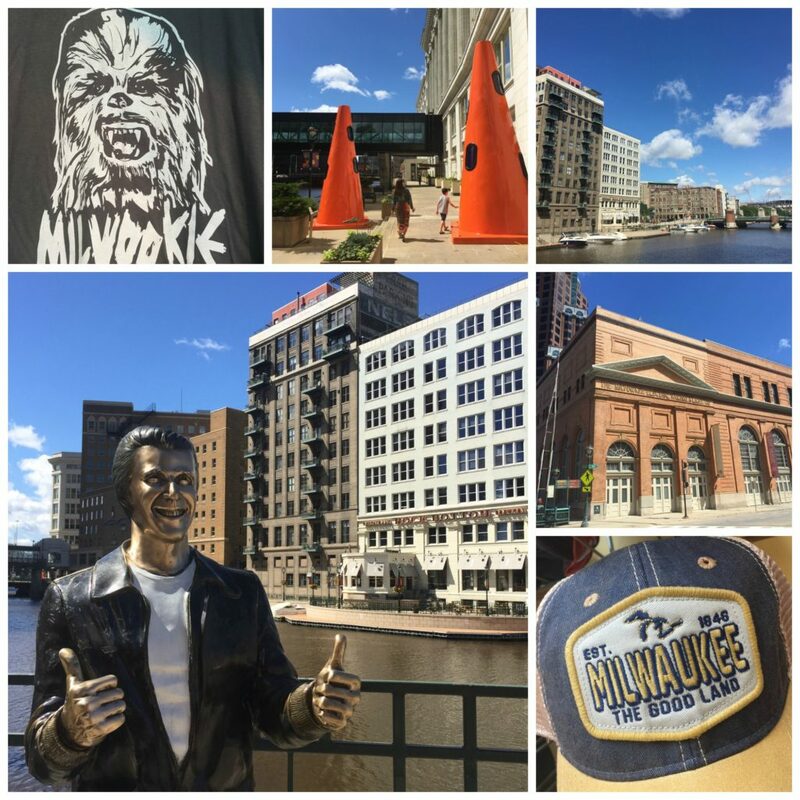 Eventually we made our way to Ale Asylum Riverhouse and had a nice meal along Milwaukee’s beautiful river walk. Following dinner, a brief rain shower produced a stunning double rainbow that hovered above the skyscrapers. After that we called it a night, went back to the hotel and watched “Moana.” We wanted to be good and rested for our next two days in Chicago. PS: “Val Kilmer” actually walked into the lobby as I was writing this. But when I had the chance to get a better look at him and hear him talk, I’m realized it wasn’t him after all. Bummer. 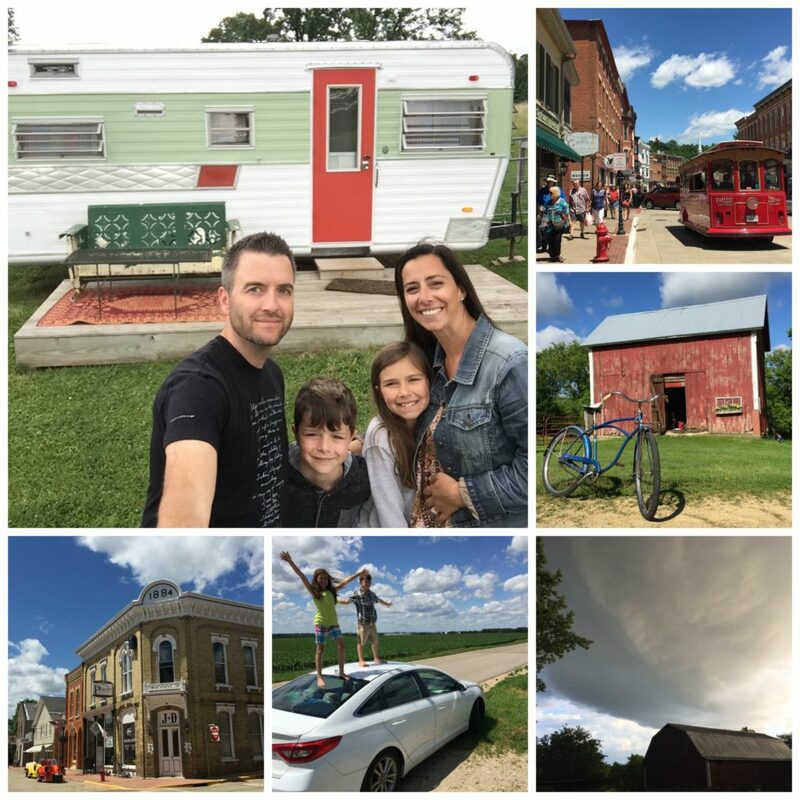 2 Responses to "Road Trip 2017: The Great Midwest, Part 4 — Galena to Milwaukee"
Thanks for the great write up about Blanchardville. While I live in Chicago full time, I own a house in Blanchardville that I visit as often as time allows. Whenever I see the mayor, he always welcomes me home. Please visit Wisconsin again and please please read the book “Driftless”. If you come back to Blanchardville, you must visit Larson Farm, the Postville Blacksmith (Bob Bergman), and metal artist Nana Showalter (nanaschowalter.com). There is also Abel Gallery in Paoli and Frank Lloyd Wright’s Taliesen. This commercial is brought to you by an ex New Yorker and New Jersey native who loves the midwest. Wow! Thanks for the travel tips, Gary! We’ll definitely be back to Wisconsin. What a beautiful state. And thanks for reading!